President Trump walked out of his second summit with North Korean tyrant Kim Jong-un on Thursday. The US presented evidence of additional nuclear sites which stunned the North Korean delegation. President Trump walked away early after a deal could not be reached. 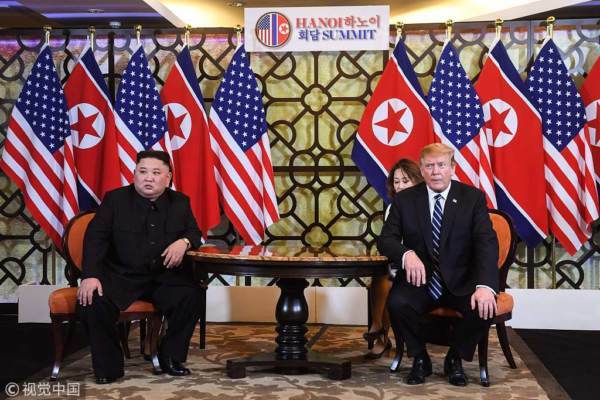 President Donald Trump said he walked out of his second summit with Kim Jong Un after the two leaders couldn’t agree on a deal to relieve North Korea of U.S. sanctions in exchange for Pyongyang giving up much of its nuclear weapons program. Trump said Kim “wanted the sanctions lifted in their entirety, and we couldn’t do that.” In exchange, the North Korean leader had offered to dismantle its main nuclear facility at Yongbyon. “It wasn’t enough,” the president said at a news conference after the summit collapsed. The U.S. presented Kim with evidence of additional secret nuclear sites, surprising the North Koreans, according to Trump. Secretary of State Michael Pompeo said that even without Yongbyon the country would still possess missiles, warheads and other elements of a nuclear program that were unacceptable to the U.S.
“Sometimes you have to walk,” Trump told reporters.